Your streaming and backup duties are in good hands with this box. 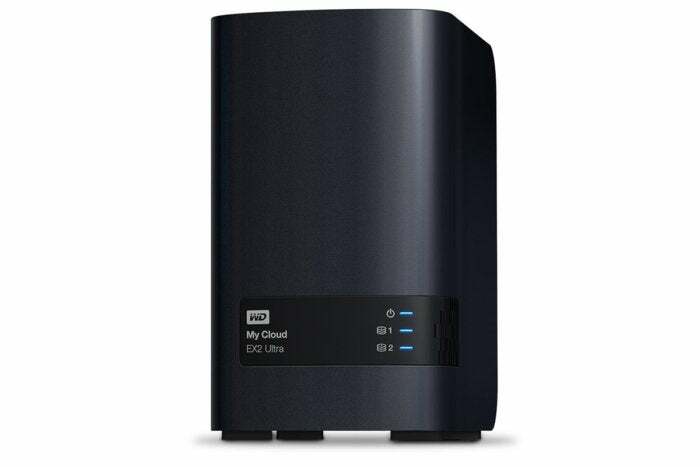 WD sells a lot of NAS boxes—products like the My Cloud EX2 Ultra are why. This box handles the streaming and backup basics with aplomb, is easy to set up, yet costs only $159 sans drives. It’s one of the cheapest two-bay NAS boxes on the market, but it's still very fast—that's a nice combination. WD could probably sell even more My Clouds if the company gave you a price break on the actual storage; populated versions of the EX2 Ultra retail for the same price as buying one empty and populating it yourself with the same WD Red hard drives. It’s easy to add or swap 3.5-inch drives by popping open the latched top, unscrewing a retaining clip, and sliding the drives in or out. But because of the unusual way drives are mounted (with bearing-head screws that fit in slots at the top of the bays), installing 2.5-inch hard drives or SSDs requires both an adapter tray and a SATA data/power extension cable. The WD My Cloud EX2 Ultra deliverd solid performances on both our read and write benchmarks. The EX2 Ultra features a Marvell Armada 385 CPU and 1GB of memory. 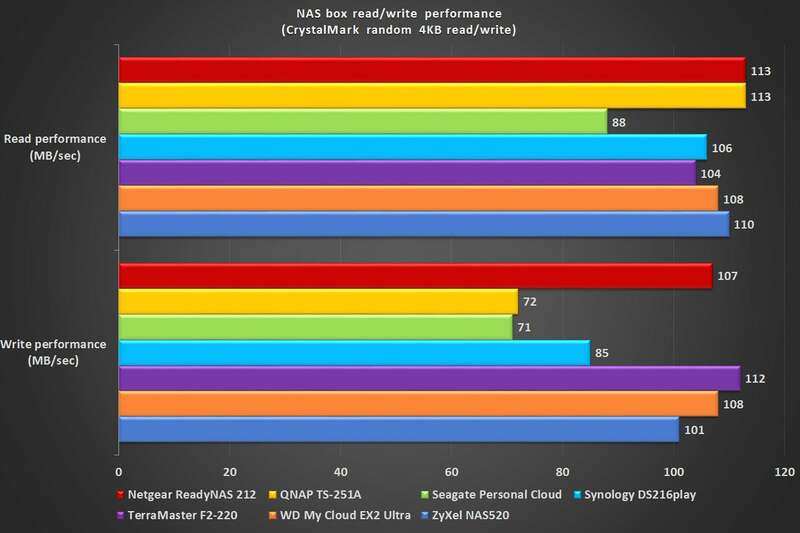 With two mirrored 4TB WD drives on board, those components powered the box to the one of the best throughput scores we’ve seen, lagging only slightly behind Netgear’s ReadyNAS 212—a product that costs twice as much. The fast throughput translated to very smooth 4K UHD (2160p) streaming and fast backups. 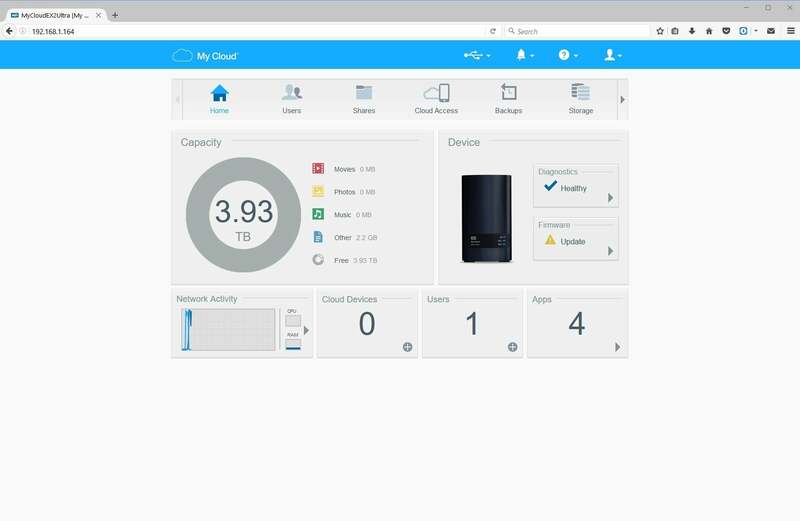 The EX2 Ultra’s interface, the same one used on all the My Cloud NAS boxes, is a clean, easy-to-browse, tabbed affair. It’s not as clever as the windows-in-a-browser featured by some other boxes, but it can be navigated just as quickly. There’s also a healthy collection of apps that includes IceCast, Dropbox, aMule, Joomla (content management), Transmission (for BitTorrent), and Z-way (for use with a Z-Wave IoT dongle). Pre-installed utilities include simple P2P downloads, as well as HTTP and FTP backups. The latter allows backup to the EX2 Ultra from remote PCs and servers, which is cool for backing up PCs without having to install a backup client. Also available are a couple of pay-to-play titles: Acronis True Image backup and Milestone Arcus Surveillance. The box is easily accessed remotely without router configuration using WD’s My Cloud web portal. Streaming options include an integrated DLNA server, Logitech media server (for Squeezebox clients), with the Plex server available for download. We had problems with Plex and its DLNA (on all NAS boxes), but WD’s DLNA server works fine. Plex provides playback within browsers, as well as on nearly every computing device in the world via proprietary Plex clients. Those worked just fine. Note: If you go the FTP route, set the Windows FTP server to relay Unix (not MS-DOS listings), or folder names won’t appear on the EX2 Ultra. If that’s Greek to you (and you’re not Greek), WD also provides client apps to sync your computers and devices to the box. Deceptively simple, there’s a lot of power behind the EX2 Ultra’s interface. The EX2 Ultra’s extended feature set is slanted toward the business/corporate community. There’s iSCSI and virtualization support, Active Directory linking, and remote .iso image mounting. If you’re looking to stream around the office and provide storage for lots of users, the EX2 Ultra is a good choice that won’t break the bank. At $159 unpopulated, the EX2 Ultra is a heck of a bargain. It’s not quite as newbie-friendly as the Seagate Personal Cloud, but it’s a much better performer, provides data redundancy (two drives), and the streaming and backup features are top-notch. It’s just an excellent all-around NAS box. Note: The My Cloud Mirror is essentially the same product with fewer corporate features. Populated models are slightly cheaper than with the EX2 Ultra, but you can’t buy one unpopulated. This super-affordable (without drives) dual-bay NAS box handles multimedia and backup with the best of them.